LED Curing Lights: As the dental industry moves more and more toward adhesive dentistry, a LED dental curing light is becoming one of the most used pieces of equipment in your operatory. 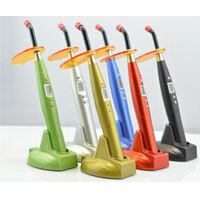 Compared to traditional halogen curing lights, they most often come cordless and are completely quiet. These LED curing lights boast powerful output, and come with a variety of time settings, handle styles and curing tips. While early models were not completely compatible with different bonding systems, most now come with wavelengths that can cure most popular materials. With new, and more powerful models emerging all the time, search below to find your own ultra-quiet, ultra-portable, and ultra-powerful LED dental curing light.